Anyone who has ever cooked on a grill is familiar with the basic procedures necessary to grill meat. What many people do not know, however, is that practically anything can be cooked on a grill using the correct methods of preparation and heating. Eggs, bread products, side dishes, and even dessert items can be grilled with just a little creativity and know-how. 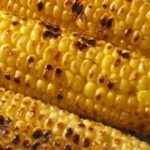 In this article, we will discuss two different methods of grilling a perennial favorite to go along with meet: ears of sweet corn. While you’re probably familiar with boiled sweet corn, the truth is that you haven’t really enjoyed corn fully until you’ve had it grilled. The first method we will cover for grilling corn is grilling it much like you would a piece of meat. To do this, all you have to do is remove the husk and silk from the corn and place it directly on the grates. You can use just the tiniest bit of olive or vegetable oil, very thinly spread over the kernels, to keep the ear of corn from sticking to the metal grates as it cooks. Watch for individual kernels beginning to turn golden brown, as this is an indication of the corn being done. If you prefer your corn a little bit on the juicier side, you can also leave it in the husk during this process, or wrap it in a single layer of aluminum foil. This will keep the water released during the cooking process contained, essentially steaming the ear of corn as it grills. Different methods will produce slightly different results. Grilling the corn without any type of wrapping will give you a sweeter flavor, because the sugars in the kernels will begin to caramelize, which also accounts for the browning of the kernels. This corn, however, will be a bit drier than corn which is steamed, due to the loss of liquid that will occur during open air grilling. Whichever method you use, butter, salt, and a touch of pepper can be added after cooking to season the corn. This method is a bit unusual, but produces some of the tastiest corn possible. Because of how it is prepared, it will offer both the sweetness of corn allowed to caramelize and the juiciness of steamed corn, delivering the best of both worlds. To prepare corn to be grilled directly on coals, cut off the end of the husk with silk protruding on each ear of corn. You will want to cut off just enough that you remove the end of the ear of corn itself. Once you have done this, get a large pot of water, and submerge the ears of corn in it, arranged so that the cut off ends face downward into the pot. Add salt and sugar to the water until it tastes noticeably of each. Allow the ears to soak overnight in a refrigerator. Once you have finished grilling whatever meat you are preparing, remove the grates of the grill. Of course, to employ this method, you must be grilling on either charcoal or wood. Lay the ears of sweet corn onto the coals, making sure that each one is in direct contact with them. Rotate the ears regularly until the husks begin to blacken and burn off. As the husks burn away, look for browning of the kernels, much as you would if grilling corn on the grates. Once you see noticeable browning, remove the corn from the fire. A gently rub with a paper towel or dish towel will remove what remains of the husk. Because the corn is laid directly on the coals, it will be hot enough to caramelize the sugars, even with the added liquid from the soaking, which is used to keep the corn from burning or drying out, producing extremely sweet and juicy ears of corn.